Figure 3-14. Variation of Bolt Velocity With Time When Driving Spring Absorbs All of Bolt Energy. connection, it should be emphasized that the purpose of the backplate buffer is to reverse the motion of the bolt with as little loss of energy as possible. In many instances, the term "buffer" is used to refer to a device which has the primary purpose of dissipating impact energy rather than of conserving energy to produce an efficient rebound action. For this reason it might be better to refer to the back plate buffer as a "bolt dcflcctor" or "rebound plate". 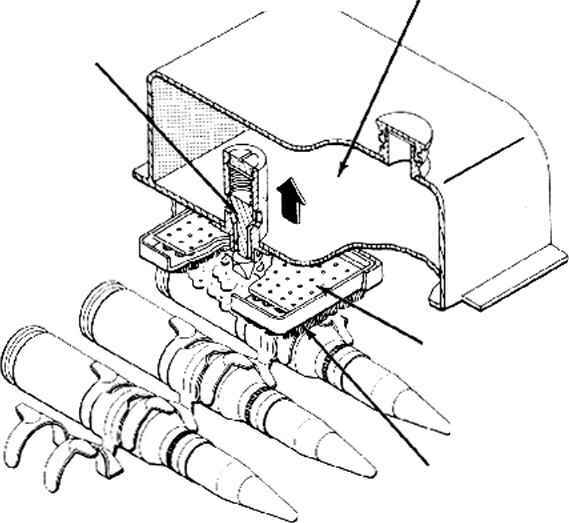 The conditions under which the bolt rebounds from the backplate in a gas-operated gun are extremely important and must be considered carcfully in the design. In dealing with these conditions, it is essential to make proper allowances for the fact that the entire gun moves in recoil and to time correctly the motions of the various parts. The necessity for careful timing arises principally from the fact that the backplate buffer is mounted on the gun and accordingly moves with the gun in recoil. Since the position of the backplate is not fixed, it is possible to have several different conditions of relative motion and impact, depending on the particular timing used in the design.